The Cover: I love these covers! I love the fact that she looks like she is in a Greek outfit. I love that isn't a girl in a corset or something "modern". I absolutely LOVE the colors of this cover- this picture is so gorgeous- I would put it on my wall! The Characters: I didn't think the author could get even better introducing more characters- but that is what happened. We are introduced to more Rogues, gods, and Demi-gods and goddesses. This is absolutely a strong point for the author. She is excellent at defining the characters and really making them realistic (and that is hard to do when we are talking about gods and goddesses. The book focuses on the relationship between Helen, Lucas, and Orion- yes there is a love triangle. I have to say though, that although I am weary of love triangles, this book did it to perfection! I am so glad that this book wasn't the "bad boy" against the "good guy". I was rooting for BOTH males and am as torn as Helen as to which to pick. The Story: This story blew me away! I have read very few sequels that are better than the first book- but this was absolutely the case while reading Dreamless. Josephine Angelini has raised the bar even higher when it comes to writing a sophomore novel. I really don't want to say anything that will spoil this book.... it was THE book that you need read this May. It was fast-paced, action-packed, and full of romance. Helen is not a feeble and weak heroine- she is someone strong and courageous enough to sacrifice her own well-being to help humanity. I will leave it at that. Go do yourself a favor and pre-order this book! 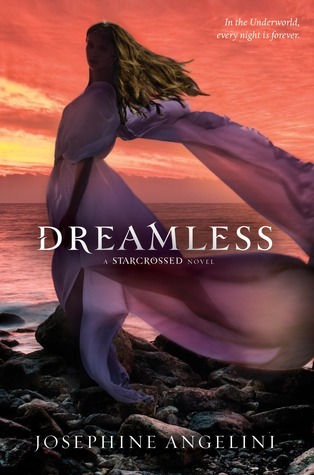 I am so glad that Dreamless turned out to be such a good book. I read Starcrossed last year, and while I thought that the book was good I just didn't love it. I think it was more because there seemed to be a lot of little extraneous facts that weren't necessary and my attention would waver from it. The important parts of the story and the characters were wonderful though. I am definitely looking forward to Dreamless. I have heard several of the reviewers that I follow say that they absolutely loved it. Thanks for your review. As usual, I am sure that it won't fail me!